Chris Canning is probably a name you haven't heard of outside of New England racing, but he is one to keep an eye on while he works his way up the ranks. Last weekend at the Southwick National, he scored his first pro points with a19th in the first moto. At just 18 years of age, Canning works very hard at pursuing his dream of being a top professional motocross racer and feels he's just getting started in the pro ranks. Learn more about Chris, in this week's Privateer Profile. Racer X: Hi, Chris. What's your story and where did you come from? I haven't been following NESC racing much and you surprised me this weekend! 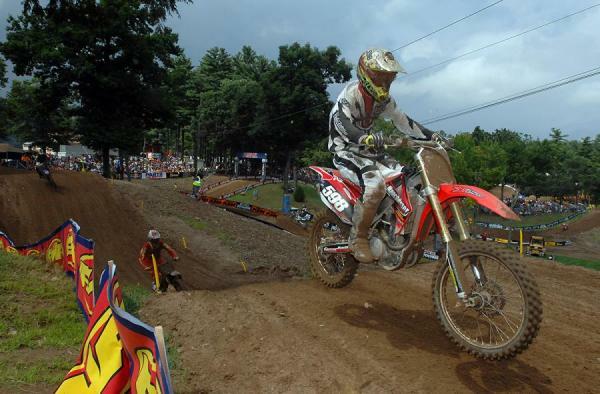 Chris Canning: Well I grew up in racing NESC and NEMA in the 65cc and minibike classes. Then I did Loretta's a couple of times but had terrible luck every year. I did the Southwick National last year and Jimmy Weinert was at the National and a local race here the weekend after, so he invited me to come to his training facility. I was down there training for about nine months and I just got back home and bought myself a 250F. I've just been working, training and doing as many Nationals as I can afford. You said you raced Southwick last year? How did that go? It was alright. It was tough because my bike was two years old and completely bone stock except for the suspension. I mean stock to the point of stock grips and everything! It was pretty clapped out but I think I got 28th overall and it was a good learning experience. I mean, it was a mud race and everyone was crashing everywhere but I held my own and it was a great experience. I'm the type that is just happy to be racing and don't really like to complain, as long as I'm at the races, I'm happy! Canning scored his first national points ever at Southwick last weekend. What's your deal with Jimmy Weinert? Do they help you out a lot? Yeah, I will be back down there this winter and just came home to work and save up some money for the rest of the Nationals. While I was there they helped me a lot with everything from bikes, parts, RV and food. I really appreciate everything they have done for me and the facility is so nice. It takes a lot of stress away when they help me at the races and during the week. Unfortunately, I wasn't in their budget for the remainder of the year, so now I'm doing everything on my own. But, I love it down there and look forward to hopefully working with them in the future. I'm very thankful of the help they gave me leading up to this, and plan on training there this winter. I don't have a vehicle right now so I bum rides to the track and try to do as many races as I can, while working 40 hours a week. It's definitely a lot harder doing everything on my own! I actually work at this guy named Ken Kaplan's house, and he races as well. I work at his house doing landscaping or anything he needs done around the house. He has like a hundred acres and a ton of work for me to do, so it gets me 40 hours a week and gets me to the races! You mentioned that you don't have a truck right now? How do you get to the races and riding? I go with my friend Mike Shea and have been going with him since I was little. He has a really nice setup, so he just picks me up and brings me to all the races, plus he races himself so it works out for now. How did you do during amateurs? Did you work your way up or how did that go? I never really had any money to get to all the big amateur races or anything like that, just always raced local. I was able to raise enough money to race Loretta's on small bikes but never had any luck at all. The first year I went, I ended up having a heat stroke and that ruined that week. The second year I was running sixth place and my bike blew up so that ended that. The last year I went on Supermini's and I did pretty good and ended up tenth overall, but I had a lot of bike problems that year also so that held me back. Loretta's for me has been spending a lot of money and having a lot of problems. Now that you're back in New England, what's a normal week like for you? How do you fit in working 40 hours a week, training, riding and working on bikes? A normal week for me is, I start Monday at 7 a.m. and work to about 4 p.m. Depending on if I did bike work on Sunday after the races or not, I might work on my bike to practice on the rest of the week. If the bikes are ready, I will normally train off the bike on my bicycle or run. I normally don't have time to ride much during the week with working, training or bike work so it's hard at times. If I can put in a half day at work I can figure out a plan to do some practicing on the bike or whatever I can fit in. Have you done any other Nationals this year or was this your first one? I went to RedBud, but I was unprepared and hadn't rode for about two months after I left Weinert's. I hurt my hip bad, had some back issues and had to save up to buy a bike. So that took a while and once I did get a bike, I only had about two weeks before RedBud to prepare. I pretty much went there on a bone stock bike and got my suspension back two days before it was time to leave for the National. I ended up missing qualifying by .02 of a second. That's the only National before Southwick that I've been able to race. You we're riding good at Southwick, how do you feel the day went for you personally? Southwick went pretty good, I wish I didn't crash in both motos! (laughs) It was kind of a bummer because I broke the top 20 in the first moto, with a crash. I was pretty happy to score my first National points, but once I hit the 25 minute mark, I'm hitting a wall and have nothing more in the tank. I put in plenty of time in training off the bike and my cardio is really good. On the bike, I just haven't been able to put in the time with everything else going on. It's something that I'm working on and hopefully can get more seat time to be better prepared. Canning works a full-time job during the week! Who helps you out with wrenching on your bikes? I have a good friend of mine that helps me at the races, and my Dad also helps so we make it happen. He was a bicycle mechanic that also knows dirt bikes well and does a good job at the races. But, I do most of the work during the week on my bike. What's the plan for the rest of the year? 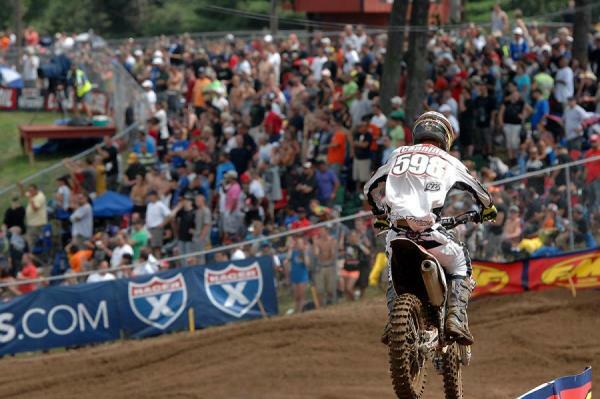 Unadilla and Steel City? Yup, I'll be at both of those Nationals but after that I will just be racing locally. Hopefully, if everything works out, I'd like to return to Weinert's and train for the winter. Are you planning on racing supercross next year? It kind of depends on what happens but I'd love to race supercross! I've only rode a supercross track one time and I picked it up right away. I really liked it and was right there with everyone who was riding supercross all the time. For only riding it once in my life, I felt fast and everyone watching told me I was going good, so I would love to race it again! I just haven't had the chance yet and it all comes down to preparation and having the money to do it. So right now you don't have anything lined up or plans to race supercross? Well, right now I'm planning on heading South for the winter to train and then do as many Nationals as I can afford. Supercross is something that I plan on doing and really want to do, I just don't know if its possible until I earn a ride or save up to do the East rounds. I'm kind of just taking one step at a time and day to day,but my goal is to one day be racing full time as a professional. Is there anything else you'd like people to know about you and anyone you'd like to thank ? I'm a hard working, good kid that just really loves riding. I'd like to say thanks to STS Graphics, Manchester Honda, Factory Connection, KNG Incorporated, X-Pro, VZF Racing, www.MotoXTones.com, Jimmy Weinert Training Facility and my family and friends for all your support!